The Clerkes of Old Sarum is a group of singers who like to sing unaccompanied music of the 14-17th centuries. We do earlier and later stuff as well, but that is our core repertoire. Requests to sing some of the slushier bits of the Victorian choral repertoire (e.g. S S Wesley, Stanford etc) also sympathetically considered. 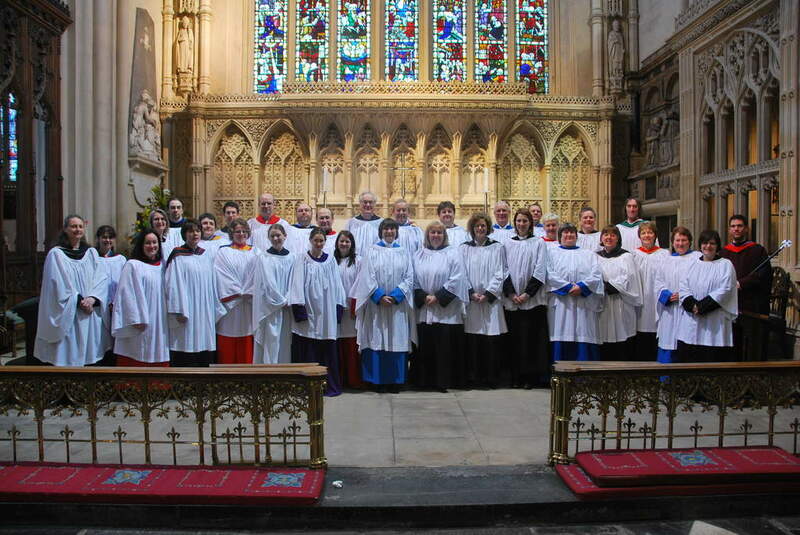 The choir specializes in religious music for the services in the "English Choral Tradition". This means doing (all) the services for a weekend or longer at cathedrals and some churches. We do between four and six visits to various ecclesiastical establishments around the country every year. We also like doing weddings. We do not rehearse on a regular basis, instead we turn up and rehearse essentially one day ahead of what we are doing. This requires either good sight reading ability or quick learning (we don't mind which). It also means that it doesn't really matter where you live. The members of the choir come from all parts of the UK and are of all ages. We welcome singers who can, or would like to learn to, sing in the choir "style" which is with warmth, commitment but little or no vibrato. A picture is sometimes worth, at least a few, words. This was taken at our visit to Bath Abbey in February 2009. One can see why we are sometimes called the "The Rainbow Choir"
Tigger edits most of the earlier music we sing and thus we feel that the following samples of our work are publishable on this medium. These works are Copyright © 1993 Clerkes of Old Sarum. Please listen to them or link to them but all broadcasting, distribution and any commercial rights are retained by the Clerkes of Old Sarum. Compare and contrast with this week's Choir on Radio 3's Choral Evensong. (This link is only here so I can easily hear last week's evensong which I invariably miss). When we have sorted some of the copyright issues out, we will be making more samples available.